I finally finished my Autumn costume for the Renaissance Festival, just in time! Literally just in time, like midnight the night before. Nothing like waiting til the last second to complete an elaborate project. This was the vision I had in mind when I created my masquerade mask a few weeks ago. I've had this picture of a leaf-dress in my head for a while now, so it was exciting to bring it to life. 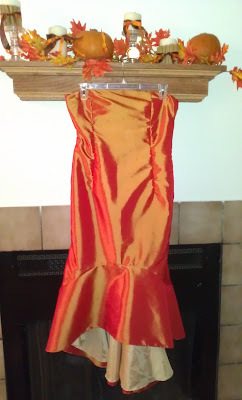 I started with some gorgeous orange iridescent taffeta which looks almost yellow in some lights and almost red in others. The fabric clearly evoked fall in my mind, so it made a good backdrop. I picked a pattern and made just a basic strapless dress, with a small flounce at the bottom and a high-low hemline. In sewing the dress, I put in this narrow rolled hem. 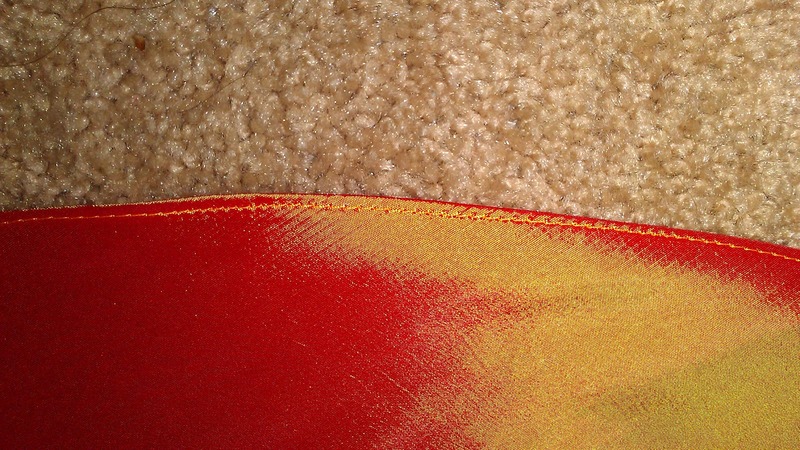 For a complete tutorial on how to put in a hem like this without a lot of headache, click here. Once the dress was completed, the fun (and slightly tedious) part began. My vision for the dress was to have a pile of solid leaves at the bottom which then faded out into the dress itself. The remainder of the dress would have a few leaves scattered here and there. You can get a bunch of artificial leaves from Amazon. 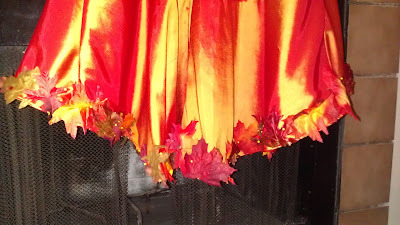 I started by pinning one solid row of leaves around the entire length of the hem. The best way to attach the leaves took a bit of a learning curve. I only wanted the leaves tacked down in the center, so they could rustle and move and curl naturally. The goal was not to have them stitched solidly down and look like appliques. I tried using a regular straight stitch on the machine, putting in about three stitches, and then stitching backward and forward a few times. This was not strong enough, however, and a few of the leaves started falling off as I went to pin on the next row. I redid the entire first row by hand, and then did half of the second row by hand, as well. Well, close enough. With two days left until I needed to wear it, I decided that wasn't going to work. I went back to machine stitching, and used a tight, narrow zigzag stitch. I only stitched for about a quarter of an inch on each leaf, but I went over it five or six times. That worked, and was much faster that doing it by hand. I sewed each leaf, lifted the needle and presser foot, then slid the fabric under the presser foot until I got to the next leaf, and then sewed that one, without stopping to clip my threads between each leaf. 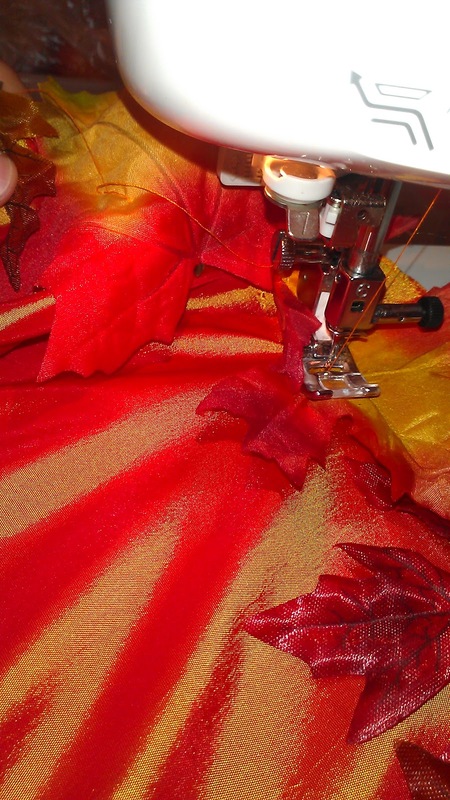 Using this method, I sewed all the leaves in the row before I took the fabric out of the machine and clipped the threads between all the leaves. This saved a lot of time by not having to pull the fabric out after every leaf, clip threads, and then get all the fabric re-situated on the machine. If you look closely at the above picture you can see the orange thread coming from the leaf behind the presser foot and leading directly to the leaf that is under the presser foot, to better show you what I mean. All together, I sewed three solid rows of leaves around the bottom of the skirt, and then added a fourth row of leaves spaced a little further apart. From there, I just placed a few randomly here and there on the rest of the dress. I could have been finished here, as originally planned, but the dress was a little loose and tended to slide down a little. I could have easily altered it to fit more snugly so it would stay in place, but I opted not to. I knew I would be wearing the dress all day, walking around outside, so I wanted the comfort of a looser dress. I decided to add a strap instead. I went for an asymmetrical strap that cut across my back and over one shoulder, because I felt like it was more in keeping with my original vision than two symmetrical straps would have been. 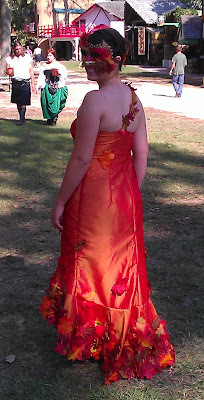 I sewed an orange ribbon into the dress at the places I wanted, then sewed leaves across the entire length. I tacked these on by hand so that I could hide the stitches better, since these leaves would be a little more visible. 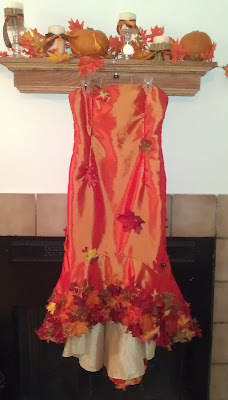 With just a few hours to spare, my Autumn Spirit costume was finished! I think the line of leaves falling across the shoulder and back is kind-of cute, and I love the leaves trailing behind on the little flounce. 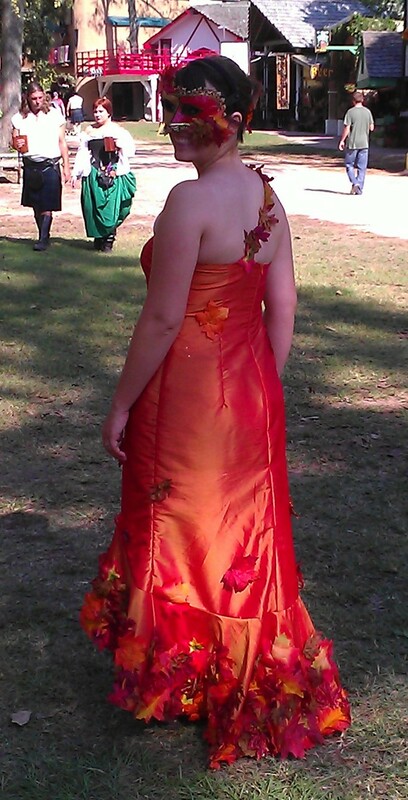 All in all, I was very pleased with my autumn-y gown, especially when paired with my mask, and had a lot of fun wearing it!